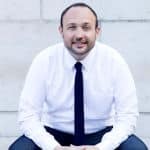 Nick Jankel, bestselling author, professional keynote speaker, well-known entrepreneur, agony uncle on BBC Radio, and the only wisdom teacher we know to advise the UK Prime Minister. He can inspire your audience with his cutting-edge Millenial ideas on empowerment and leadership – and engage them with his playful and warm manner as he shares big ideas in purposefully accessible ways. We are currently launching his new book Spiritual Atheist, which has been the No.1 Hot New Release in Philosophy on Amazon!